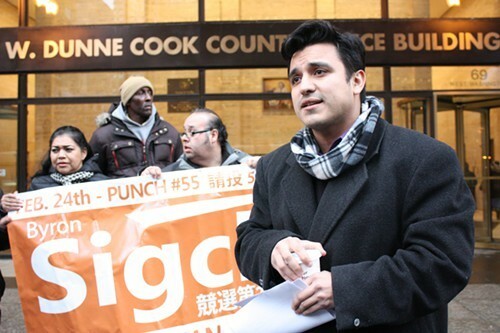 25th Ward candidate Byron Sigcho stands outside the Chicago Board of Elections Tuesday after filing a lawsuit requesting a recount within the ward. Standing in the damp chill after a morning of freezing rain, 25th Ward aldermanic candidate Byron Sigcho made his case for a recount outside the Chicago Board of Elections Tuesday: he alleged that the campaign of incumbent alderman Danny Solis was responsible for a range of high jinks on election day. "We know that there was definitely manipulation," said Sigcho, a UIC instructor. "It's no surprise that [Solis] has a large margin, but it's really hard to believe that we got that few votes." One of four challengers, Sigcho finished second to Solis with 18 percent of the vote, but he's just 72 votes away from forcing a runoff. His lawsuit alleges that the Solis camp manipulated absentee ballots and had volunteers improperly handling ballots and vote counting devices at polling places. The suit also claims there were calibration errors on touchscreen voting machines, unsecured ballot boxes, and other equipment failures which caused polling locations to either not open on time or close early. Solis has served as alderman since former mayor Richard M. Daley appointed him in 1996, and last week he won every single precinct in the ward. But the past two elections were tight. In 2007 he avoided a runoff only after votes for a disqualified candidate were thrown out. Four years ago Solis was pulled into a runoff with Cuahutemoc "Temoc" Morfin but won it with 54 percent of the vote. When the ward was remapped in 2012, parts of east Pilsen—where Solis fared poorly against Morfin—were dropped, while turf was added in the Near West Side and West Loop neighborhoods. The remap also chopped a heavily African-American affordable housing complex in half between the 25th and 11th wards. The housing complex, the Barbara Jean Wright apartments, is one of three areas—including the neighboring George Collins senior homes and Fosco Park polling place—where Sigcho said his campaign suspects extensive voter fraud and electioneering. The recount process is tricky. Candidates can only request a recount in a quarter percent of precincts within the ward and have to front the funds for those recounts themselves. However, the Chicago Board of Elections also automatically does a random recount of five percent of precincts citywide. In the 25th Ward, one of those happens to be the Fourth precinct, which contains those three Near West Side areas where Sigcho has major concerns about voter fraud. Sigcho lawyer Nicholas Kefalos said a recount in that area would only help his client. "We did a lot of outreach over there," Kefalos said. "We polled very well over there prior to the election and we have a lot of affidavits indicating people voted a different way." Tom Bowen, a spokesman for Solis, wouldn't comment on Sigcho's allegations. Instead Bowen would only say the alderman was "thrilled" to be reelected. Challenger Tim Meegan accuses 33rd Ward alderman Deb Mell of illegal campaign tricks and files for a recount. Having embarrassed Rahm in yesterday's election, Chicago's voters can expect the mayor to go negative and nasty against Chuy Garcia in the coming campaign. Half of the Barbara Jean Wright apartments are in the 25th Ward and half are in the 11th Ward. Welcome to Chicago.